During the Great Depression, Walt Disney agreed to accept $300 from a man who said "he wanted to put the mouse on the paper tablets children use in school," according to the Walt Disney Family Museum. "This transaction no t only provided the cash-strapped Disney brothers with some quick money but also suggested to them there might be other ways to exploit Mickey's image on products. Thus began a revolution in cartoon-character merc handise. "This transaction not only provided the cash-strapped Disney brothers with some quick money but also suggested to them there might be other ways to exploit Mickey's image on products. Thus began a revolution in cartoon-character merchandise. 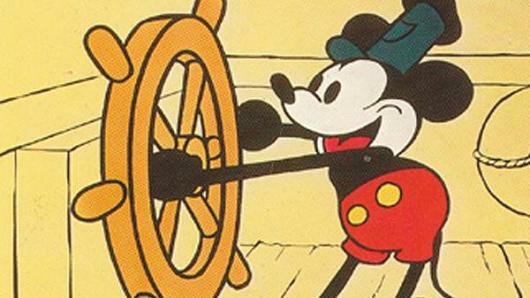 As Mickey Mouse's first appearance in "Steamboat Willie" marks its 86th anniversary, Walt Disney shares have a market cap of about $153 billion, and a lot of that is owed to the mouse who starred in that eight-minute short. Not even 10 years after his debut, the Mickey Mouse brand—and The Walt Disney Co.—already had serious international exposure. The company had offices in key cities, including London, Paris and Sydney. public stock in 1957, complete with a stock certificate that featured a picture of Walt Disney and Mickey. Even though Mickey went on a 30-year hiatus starting in 1958, the company certainly didn't. 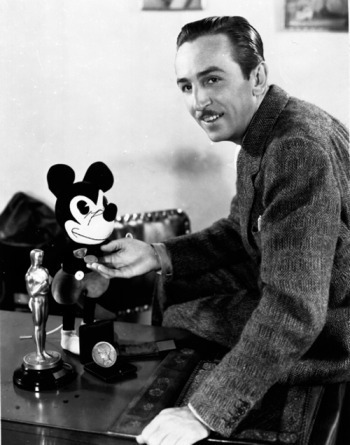 Disney invested the $3.5 million it had made off its IPO in 1940 to continue to grow. A few years later, its first theme park opened in Anaheim, California. That same year, the Mickey Mouse Club debuted on TV. Decades later, the show became the launching point of several well-known artists' careers, including Christina Aguilera, Britney Spears, and Justin Timberlake. 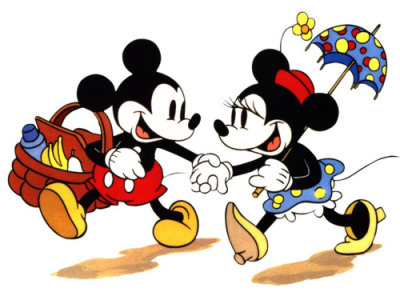 Today, the Mickey Mouse brand is still as popular as ever. And for Disney, this has meant huge profits. But despite Mickey's notoriety, there are a few things you might know about the famous mouse. Walt Disney's first animation company, Laugh-O-Gram Studios, went bankrupt in 1923. When the studio closed, Disney took the reel for what would eventually become "Alice in Wonderland," the adventure film, in 1951. Mickey Mouse actually started off as a rabbit. Walt Disney and Ub Iwerks created Oswald the Lucky Rabbit, but after a disagreement over rights with Universal Studios, the film distributor, Disney refused a pay cut and created Mickey Mouse. In 2006, The Walt Disney Co. got the rights to the character back. 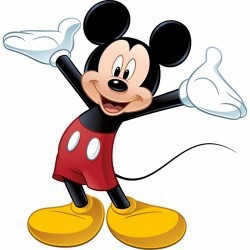 In 1978, on his 50th anniversary, Mickey Mouse became the first cartoon to receive a star on the Hollywood Walk of Fame for his role in animated films. Since then, 14 other fictional cartoon characters, including four Disney characters, have been honored with a star there. The Band Concert," released in 1935, was Mickey's first appearance in color. For this short film, he was given a new look. By 1940, his look would evolve into what we know him to be this day. One of the earliest Mickey goods to go on sale was the Mickey Mouse wristwatch. Introduced in 1933, the watch originally retailed at $3.75 and sold at a pace of 2 million annually. The now-vintage watches can be found on eBay with prices ranging from 10 to 300 times their original value. Today, Mickey Mouse merchandise sales reportedly makes up 40 percent of the company's consumer products revenue.